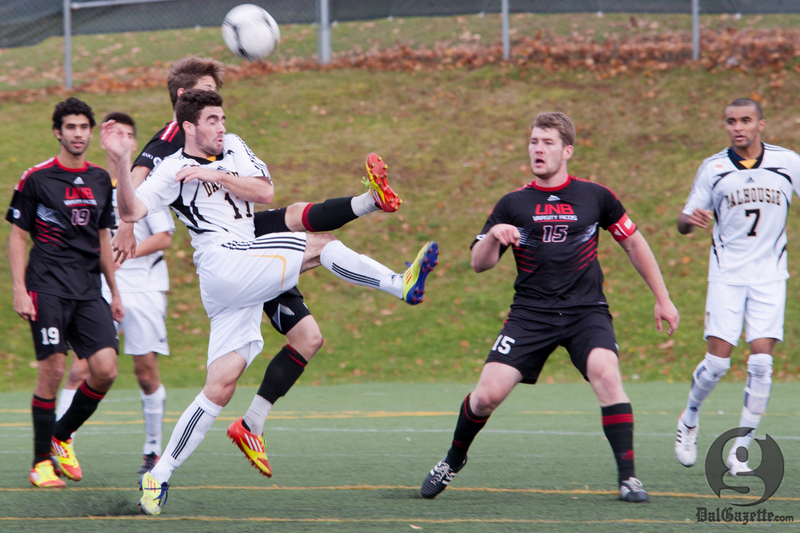 For the fourth straight year, the Dalhousie men’s soccer team has failed to qualify for the AUS championship game. The Tigers could not overcome their elusive semifinal hurdle once again, losing 4-3 to the UNB Varsity Reds in Charlottetown. A sleepy start from the Tigers on Nov. 3 left them down 3-0 in the first half. It took 22 minutes, in fact, for Dal to get their first shot on net. The Tigers regrouped, however, raining shots on UNB keeper Aaron McMurray before Nathan Rogers scored at the 45 minute mark. In a thrilling second half, Rogers scored again for the Tigers, converting on back-to-back goals to tie the game at three apiece with 15 minutes remaining. Despite the dramatic comeback, the Tigers were unable to convert their final chances. The Varsity Reds played spoiler, scoring with four minutes remaining to win the game and advance themselves to the championship. UNB ultimately lost 3-2 to Cape Breton. “It was a bit of a heartbreaker,” says head coach Pat Nearing, now in his 15th season with the Tigers. Nearing draws many positives from the weekend, including Nathan Rogers’ hat trick against the Varsity Reds. Rogers wanted to redeem himself for missing a crucial penalty kick in the first half. In Friday’s quarter-final against Moncton, the Tigers were outclassed during a scoreless first half. Dal came out firing in the second, and the momentum shift led to a penalty kick for the Tigers with 25 minutes remaining. Rogers would convert, sending Dal to the semifinals with a 1-0 victory. Rogers knew first-ranked UNB and fifth-ranked Moncton would be tough competition. “We played both teams two weeks before, so we knew what to expect,” he says. Still, he says, the season didn’t have to end there. The team will lose veteran strikers Julian Perrotta and Sam Karklins to graduation, along with defenders Kerry Weymann and Rylan Palmer-Dixon. Despite another semifinal loss, Nearing finds little fault with his players. Nearing can also be proud of several Dal players who went home with league honours after Saturday’s match. Weymann was named an AUS first team all-star and Rogers and Bezick Evraire were named second team all-stars. Rogers tied striker Tyler Lewars for the team lead in goals this season with five.